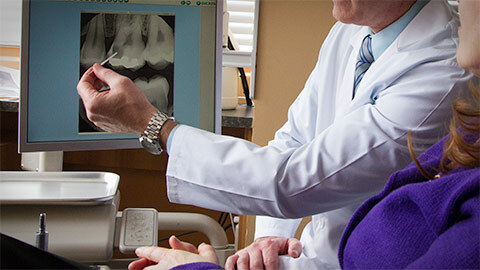 Endodontics is the branch of dentistry that deals with the interior of your tooth (the “pulp”). It’s an important service, as treating problems inside the tooth avoids decay and tooth loss, preserving the natural tooth for many years. When a cavity is left untreated or undetected, the decay and bacteria advance further into the tooth and affect the pulp. This leads to pain and infection, both of which can become chronic if not treated. A root canal treats the problem by removing the infected or decayed pulp and nerve tissue, disinfecting the space left behind, and then filling it with material. A crown is normally recommended to secure the tooth from further trauma or decay. Root canals are the most common for m of endodontic service, but our treatment is anything but common! Our dedication to respecting individual needs and concerns while always providing a caring environment means you’re getting our most effective and compassionate treatment - every time.